• Address comorbid medical conditions as potential causes of anxiety and maximize treatment. For example, patients with COPD experiencing anxiety should be treated per Global Initiative for Chronic Obstructive Lung Disease guidelines for COPD. An aggressive COPD treatment plan may improve respiratory status and, in turn, reduce anxiety. • Rule out delirium. The treatment plan for delirium will look much different from treating anxiety. 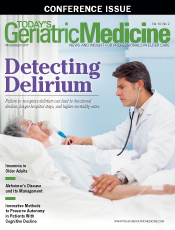 Keep in mind that BZDs can induce delirium in older adults and individuals with medical illness. • Evaluate medications as a potential cause of anxiety and adjust as appropriate. Caffeine, amphetamines, other stimulants, thyroid medications, glucocorticoids (eg, prednisone), some antidepressants, and highly anticholinergic medications (eg, antihistamines) can worsen anxiety symptoms. • Nonpharmacological interventions are recommended as first-line treatment. Increased exercise, relaxation techniques, increased social activity, and meditation alone or with medications are recommended interventions. • Consider cognitive behavioral therapy (CBT). The principal recommended indication for BZDs is for short-term treatment (from two to six weeks) of anxiety that is severe and debilitating. Continuing BZDs beyond four to six weeks may result in the loss of effectiveness, the development of tolerance, dependence with potential for withdrawal syndromes, persistent adverse side effects, and interference with the effectiveness of other medications and counseling. Using BZDs on an as-needed (PRN) basis is advisable. Continuous use for more than two weeks increases concerns related to withdrawal effects. If used continuously for two weeks or more, the dose should be tapered rather than abruptly discontinued. While there is some evidence supporting the effectiveness of BZDs and other hypnotics for the relief of short-term insomnia (one to two weeks duration), there is less evidence supporting long-term insomnia treatment. The treatment period for insomnia should not exceed two weeks. The primary significant clinical difference between older BZD hypnotics and newer "Z" benzolike ones such as zolpidem (Ambien), zaleplon (Sonata), and eszopiclone (Lunesta) is the shorter half-life. All three have similar risks of dependence and tolerance. A search for an etiology of the insomnia should be undertaken. Sleep hygiene and other nonpharmacological measures are preferable. A key to optimizing the use of BZDs is to ensure patients are not started on these medications if at all possible. Before BZD treatment is started, always consider that some patients will have significant difficulty discontinuing the medication at the end of even acute treatment periods. Patients should clearly understand the side effect risks and the potential for dependence. Patients should be advised explicitly regarding the planned duration of therapy, exit strategies such as short taper, or initiation of alternative treatments. BZD use is contraindicated during active substance abuse, including alcohol. A number of medical conditions may be aggravated with BZD use including fibromyalgia, chronic fatigue syndrome, depression (except short term use up to four weeks to treat associated anxiety), bipolar disorder (except for urgent sedation in acute mania), ADHD, and impulse control disorders. While BZDs are often used for short-term treatment of insomnia in acute grief, they should otherwise be avoided in treating grief reactions, as they may suppress and prolong the grieving process. BZDs can decrease the respiratory rate, especially in conditions where the rate is already compromised. These medications may worsen hypoxia and hypoventilation in asthma, sleep apnea, COPD, congestive heart failure, and other cardiopulmonary disorders. In 2016, as part of its Opioids Action Plan to better inform prescribers and protect patients, the FDA began requiring stronger warnings for opioid analgesics, prescription opioid cough products, and BZD labeling related to serious risks and death from combined use. An FDA review found the growing combined use of opioids with BZDs or other drugs that depress the central nervous system (CNS) has resulted in serious side effects, including slowed or difficult breathing and deaths. Opioids are used to treat pain and cough; BZDs are used to treat anxiety, insomnia, and seizures. In an effort to decrease the concurrent use of opioids and BZDs or opioids and other CNS depressants, the FDA added boxed warnings to the drug labeling of prescription opioid pain and opioid cough medicines, and BZDs. • Limit prescribing opioids with BZDs or other CNS depressants only to patients for whom alternative treatment options are inadequate. • If prescribed together, limit the dosages and duration of each drug to the minimum possible. • Warn patients and caregivers about the risks of slowed or difficult breathing and/or sedation, and the associated signs and symptoms. • Avoid prescribing opioid cough medicines for patients taking BZDs or other CNS depressants, including alcohol. BZD use should be limited and accompanied by clear documentation describing the rationale for their use, including risk to benefit. Use a PRN BZD only if symptoms of acute anxiety are severe or debilitating or if required during the implementation of antidepressant therapy to treat anxiety. Avoid the use of BZDs with opioids and other CNS depressants. Limit prescribing orders to a maximum of 14 days. Orders should not be extended without further practitioner evaluation. 1. Ivan MC, Amspoker AB, Nadorff MR, et al. Alcohol use, anxiety, and insomnia in older adults with generalized anxiety disorder. Am J Geriatr Psychiatry. 2014;22(9):875-883. 2. Markota M, Rummans TA, Bostwick JM, Lapid MI. Benzodiazepine use in older adults: dangers, management, and alternative therapies. Mayo Clin Proc. 2016;91(11):1632-1639. 518697.htm?source=govdelivery&utm_medium=email&utm_source=govdelivery. Published August 31, 2016.